Flood Hancher Auditorium in 2008. University of Iowa leaders have settled on a location to rebuild Hancher Auditorium and the School of Music. U-I President Sally Mason will recommend to the Board of Regents that Hancher be built on the west side of campus, a few hundred yards up the hill from its current location. “We’re looking at sites that will be well out of the floodplain for Hancher Auditorium and that was certainly a driving factor in terms of site selection for these facilities,” Mason said. 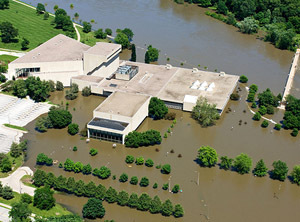 Hancher, the Voxman Music Building and Clapp Recital Hall were flooded in 2008. Construction on the new buildings could begin within 18 months. “It’s very important we do this well, we do it right and we do it so that all Iowans will be very proud of what we will have accomplished at the end of this,” Mason said. Under the plan, the School of Music and recital areas would be located just south of the Old Capitol Town Center, adjacent to the main east campus along South Clinton Street. The combined cost is expected to be more than $250 million but FEMA will contribute a significant amount. University officials will present the proposal to the Board of Regents on February 4.